The new depth controller by CNC-STEP comes with a linear rail with ball bearing circulation, thus it’s not only smooth-running but also indestructible. The pressure is regulated by means of a spring. Watch this Video and see how simple the one-time installation of the depth controller for engraving works is. This video also shows you how simple the engraving stopper for milling works can be clamped. With its open and in the area of hundredths of millimetres depth-adjustable teflon-coated flange it smoothly slides over any material without scratching it. 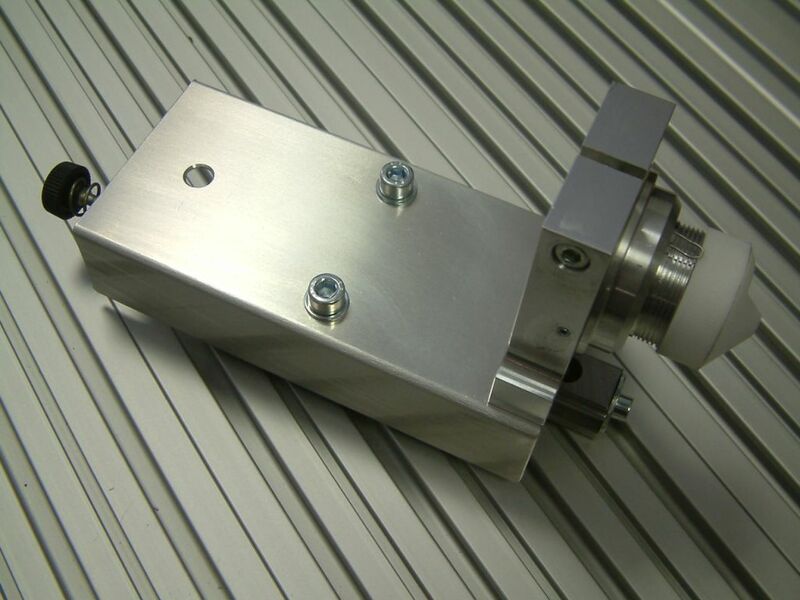 Thus it secures consistent engravings and processing depth for all engraving works and the manufacture of circuit boards/PCBs independent from varying material thickness or variations in the plainness of the table surface. Once mounted, the engraving stop never needs to be removed, as in its clamped modus it is adjustable to any milling works due to its high stability.